Stade Auguste Delaune is home to newly promoted Ligue 1 football club, Stade Reims who are based in the north east of France. Originally opened in 1935, the ground underwent a 4 year renovation period between 2004-08 where approximately €60 million was invested in making it a 21,684 all-seater stadium. Stade Auguste Delaune opened on the 2nd of June 1935 with a ceremony conducted by French President Albert Lebrun with a then ground breaking 18,000 capacity which made it one of the largest stadiums in the country. This was just in time for the 1938 World Cup and Stade de Reims’ stadium hosted a first stage of knock-outs match between Hungary and Indonesia (Dutch East Indies) round, with the Hungarian’s winning by six goals to nil. Originally known as Municipal Stadium de Reims or Stade Velodrome (Not to be confused with Marseille’s), it wasn’t until after the Second World War that the ground received the name Auguste Deluane who was tortured to death by the Gestapo in 1943 who sought his capture following his links to the French Resistance movement following the Nazi invasion of his country. In the 1950s and early 1960s Stade Reims popularity surged when they won a remarkable five Ligue 1 titles (1953, 1955, 1958, 1960, 1962) and this most successfully period of the club’s history required that the club expand the stadium in order to allow more fans to see the team play football. The construction of a new two-tiered grand stand along the side of the pitch of saw the club receive a record attendance of 27,774 although in the league it was set at 25,225. 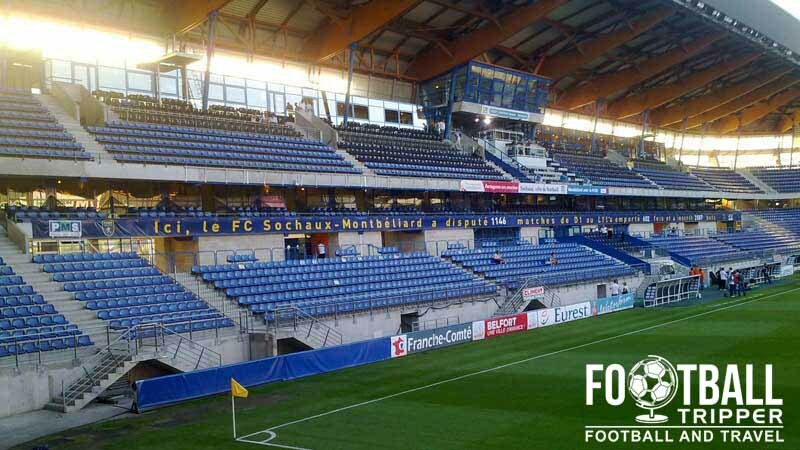 Following on from a disastrous period for the club which saw them briefly return to amateur status as a result of mounting debts and mismanagement, Stade Auguste Deluane became run down and received no investment making it a set of incredibly outdated facilities. 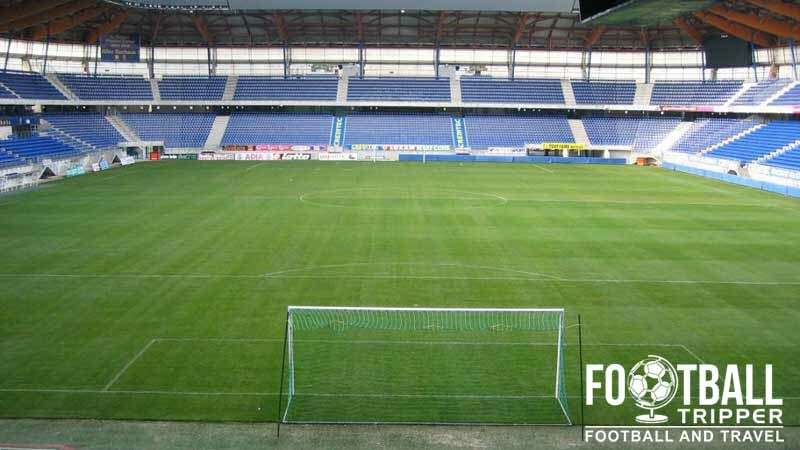 It wasn’t until a return to The second division in 2002 that Reims had financial stability to rebuild the dangerous Deluane, and in August 2008 the club reopened a fully renovated 22,000 capacity Stade August Delaune. Auguste Delaune is comprised of four stands: Batteaux (Nord), Meano (Est), Jonquet (Sud) and Germain (Ouest). Away fans are housed within the easternmost section of the northern goal-end stand. Spanning two tiers of roughly equal size, the visitors area is cordoned off by a strip of mesh netting to the west, whereas the access tunnel acts as a natural barrier between both sets of supporters in to the east – particularly to those in the lower tier. Watching Stade de Reims play football at home today is a completely different proposition compared to what it was in the late 1980s and 1990s. Away fans today are visiting an intimate arena with flawless views throughout meaning that even with the “cheapest” or “worst” seats in the house, you’ll still have a superb view of the action. Located within a relatively compact city centre the map below outlines four of the most football friendly pubs for fans – all of which are walkable from the stadium in under 15 minutes. As an aside, Reims is one of the Champagne centres of the World boasting over 250km of wine cellars in the city along, with iconic brand Dom Perignon being one of the historical assets of Reims economy. There are a handful of restaurants 5 minutes North of the stadium just across Pont de Vesle bridge including La Petit Basque, the classy sounding Universal Planet Pizzeria Kebab, Restaurant Le Piazza (not a typo) and snappily named Casa Presto. As well as Champagne the local area is famous for its Pink Vanilla flavoured biscuits, gingerbread, mustard, vinaigrette, and the Bayonne boneless pork shoulder a must try dish. Opening hours: Tuesday to Saturday 10am 12pm and 2pm to 6pm. For home games on a Sunday, the store will open at 2pm until kick-off and then after the final whistle for 30 minutes. The tourist office of Reims allows visitors and football fans the chance to go behind the scenes of Stade Auguste Delaune and discover the “secrets of the Red and White Chamber” by embarking on a 60 minute guided tour. With the starting point of the official store, and a free drink at the end of the tour, fans of Stade Reims are in for an absolute treat. The tour costs €5 for adults and is free for children under the age of 16 when accompanied by an adult, with more information such as date and time of tours available by phoning the tourist office on 03.26.77.45.00 and via this page. 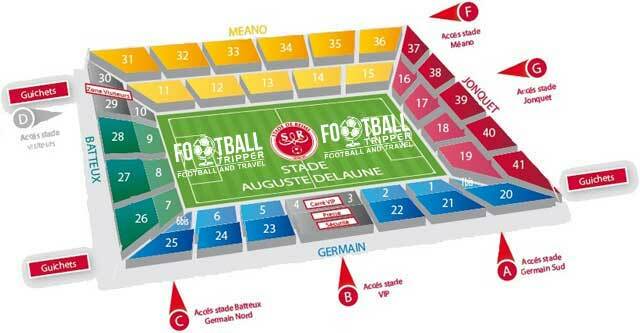 Tickets to see Stade de Reims play at home can either be purchased online or at the club shop/ticket booths at Auguste Delaune in the days leading up to the match (Wednesday to Saturday 2.00 – 6.00 pm) until they become sold out up to half time. Pricing wise, Reims categorise their games based on three levels of demand, listed in order of cheapest to most expensive: Classic, Gala and Prestige. 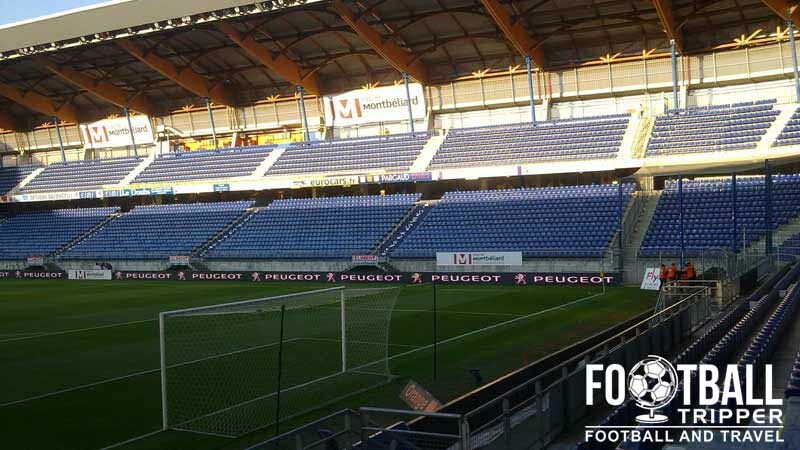 The regular “Classique” matches start from €11.00 for Tribune Jonquet with the most expensive seats in Tribune Méano going up to a more than reasonable €32.00. For Gala matches, prices for similar tickets start at €14.00 and end up at €44.00, which again is pretty reasonable. Stade Auguste Delaune, the home of Stade de Reims is located towards the south-west of the city centre of Reims, tucked behind the A344 motorway, the Canal de l’Aisne a la Marne and La Vesle river. The concrete exterior of Stade August Delaune on a grey, overcast day. 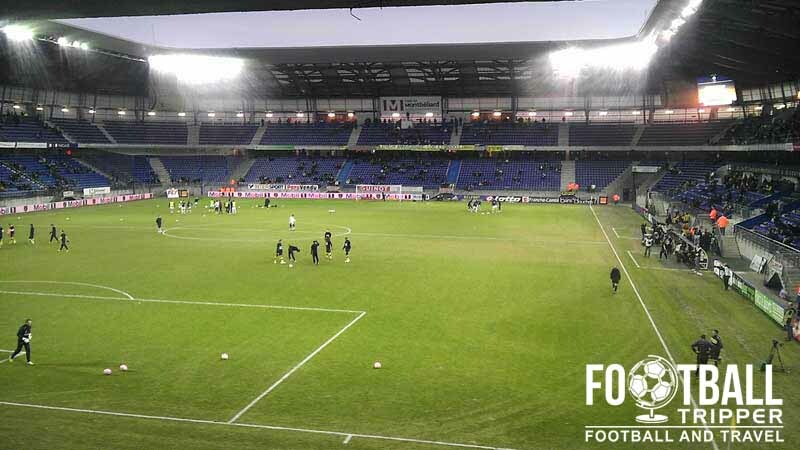 The stadium is nestled between the A344 motorway and the large Avenue D’Epernay which makes it a relatively easy drive. From the A4 (E46) take exit 24 signposted as Reims-Cathédrale / Complexe Sportif and then turn away from the city centre, following the road parallel to the river/canal until you arrive at Stade Auguste on your right hand side. It may be advisable to part away slightly from the ground with a host of options within the city only 15 minutes walk away including: Auguste Delaune Stadium Parking On Erlon’s (650 places), Buirette (432 places) and Cathedral ( 565 places), City Hall (152 seats) and Gambetta (280 places). This Reims Car Park website has a pretty decent map which explains better. The main train station of Reims (Gare de Reims) is every so slightly Northwards of the aforementioned centre meaning that you can expect to add 5 minutes or so to your journey if you plan to travel by foot. Gare de Reims is run by the SNCF (French National Railway Company) and others strong transport links to Paris, Dijon and Châlons-en-Champagne. You can get to to Auguste Delaune Stadium using Trams A and B with Comédie and Courlancy being the two nearest stations/stops. One of the many trams you can take around the city. In total there is over 11.2 km of track which serves over 23 stations across the city. During the day, you can also get to the Stade by catching either buses 1,7,8 and 10 which will drop you off at the Comédie tram stop which is the closest point to the stadium. In the evening Bus lines 1 and 2 will perform the same function for you. The closest airport to Reims is Paris-Roissy (Charles de Gaulle) International airport which is around 130km West of the city, and a 90 minute drive. There is also the Champagne-Ardenne TGV high speed rail which can do the job at a touted 30 minute trip, but take this estimated time with a pinch of salt. The closest hotels to Stade Auguste Delaune are all less than 10 minutes away and accessed by crossing the Vesle river and L’Aisne a la Marne canal. Choices are Hotel Ibis Styles Reims Centre Cathedrale, Mercure Reims Centre Cathedrale Hotel and Rossillon Martine. As the city is so small, there’s not much advantages to be had by looking elsewhere on the map, unless you desparetly want to be on the doorstep of the station. In which case try Sejours & Affaires Reims Clairmarais Apparthotel.